As Irelands only OPITO approved training provider we’re delighted to announce that we have over 30 scheduled Further Offshore Emergency Training (FOET) Courses scheduled for 2016. 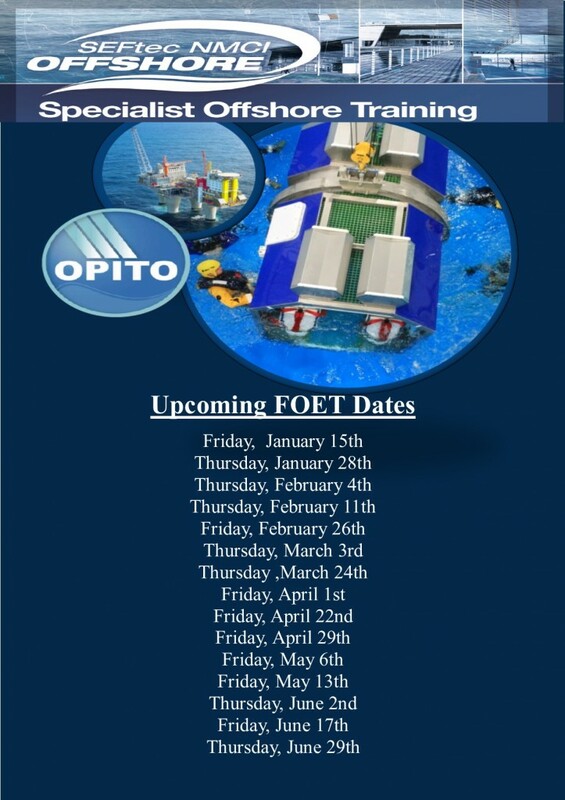 A FOET is a refresher Basic Offshore Safety Induction & Emergency Training (BOSIET) Course. This 1-Day offshore course is designed to meet further emergency training requirements for oil and gas industry personnel. Delegates will be required to demonstrate their level of knowledge and understanding of the safety training course content. Delegates will be given further training to enhance and complement their existing knowledge of the hazards encountered when working on offshore installations and the course forms part of our ongoing emergency training programme. Check out course dates below or click here for a full listing of 2016 dates.